Nissin Sasuke is a great little rod with more backbone than I thought. I use it to fish a small 15ft wide creek near a spillway where water falls out of the a nearby lake. A little combo of 3.5# level line about 3ft and a 1ft of 2lb tippet and 1ft of 1lb tippet tied a 18 # gold bead head zebra midge with a small float is a wonderful combo for this rod I notice a 4.5# level line seems to be too light. April 9th was a great day, caught bluegills ranging from 2in to 5in sometimes it felt overwhelming and you thinking the rod will break never had a issue tho. I hooked into a big shiner with a decent girth and which turned into a long 7min fight, luckly with the surprise stiffness to this rod it handles bigger fish than expected also has a faster action than my Iwana. My conclusion: I wouldn't fish this rod in a pond with 8in gills are normal as well as bigger bass. I really enjoyed hearing about catching fish on a true micro rod. My micro rod is a Shimotsuke Kiyotaki. 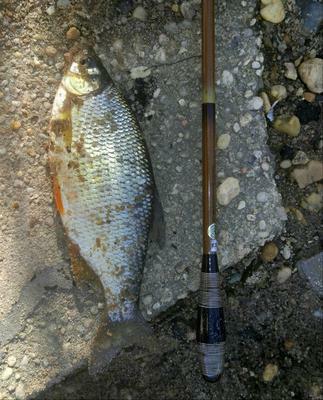 One of my mico spots has bass, and larger bluegill. It handled an 8 inch bluegill, but I could tell I was at about its limit. I am finding having the right rod for the job is important when fixed line fishing if you are going to maximize the fun!